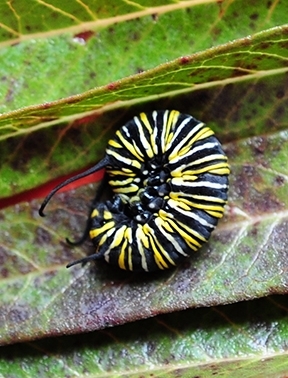 Our unseasonably warm temperatures in November yielded 12 unexpected surprises: 12 monarch caterpillars munching away on the tropical milkweed in our pollinator garden in Vacaville, Calif. Didn't they get the memo? So we brought them in, zipped them into our mesh butterfly habitat from the Bohart Museum of Entomology, UC Davis, and began feeding them the last of the milkweed. Would they make it? Maybe. "I'm Dreaming of a Green Chrysalid..."
The first caterpillar formed a J. "It's Beginning to Look a Lot Like Chrysalis." A gold-rimmed jade green chrysalis appeared, looking very much like a Christmas tree ornament or a precious gem. 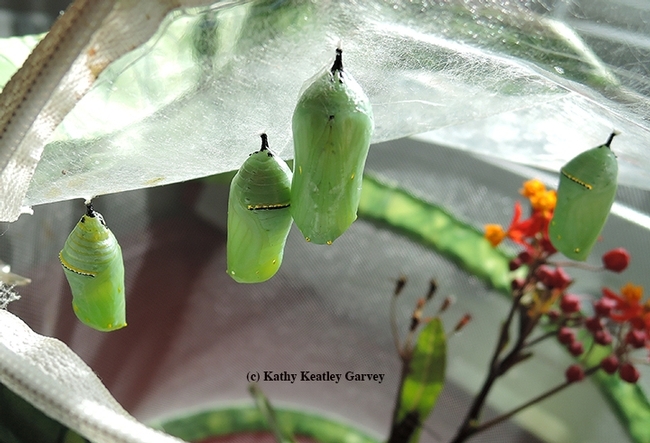 "It's Chrysalis Time in the City..."
Soon, 10 more chrysalids formed. One more to go. Look, No. 12, don't get into a mid-life chrysalis or anything. Do your thing. Please. Finally, on Dec. 15, the last caterpillar pupated. Twelve chrysalids. And just like magic (Nature's magic), a stream of butterflies began eclosing. Today we have five monarch butterflies and seven chrysalids. We expect more eclosures. There may be a Tiny Tim among them. That happens. But no sign of the protozoan parasite, Ophryocystis elektroscirrha (OE) or tachinid flies that make the most of the "hostest with the mostest" (they lay their eggs in the caterpillars and eat the host from the inside out). What to do with the five monarchs? It's rainy and cold. Wait for a warmer day and release them? Help them along by traveling to an overwintering site? Offer them "bed and breakfast" at the Bohart? 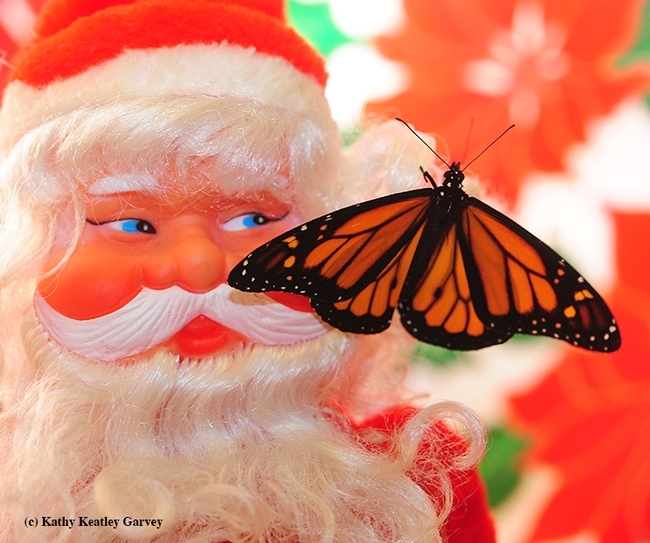 Meanwhile, “Christmas” and "Chrysalis" seem inseparable.